*Applies to retail orders only. All of our Decorative Films ship in our specially designed box constructed to pass and exceed all UPS Shipping Lab standards. 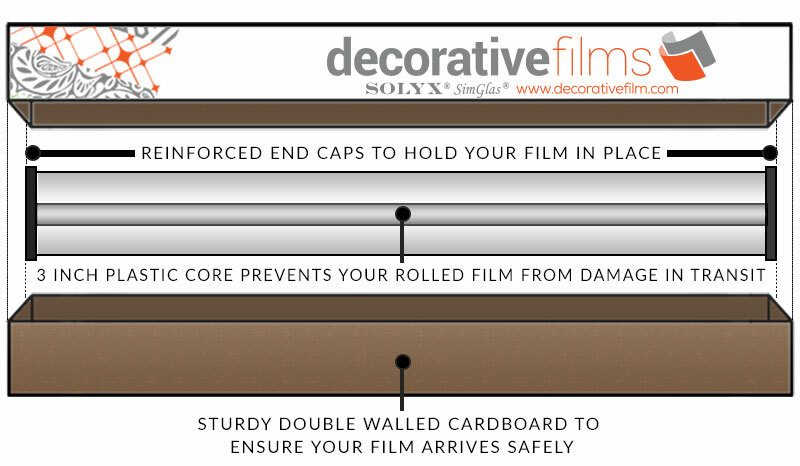 First your film is rolled onto a durable 3 inch plastic core and placed in a plastic sleeve to keep your film clean and provide extra protection, next your roll is fitted with reinforced end caps to hold your film snugly in place. Finally, your film is placed inside our sturdy double walled cardboard box and sealed to ensure your film arrives safely and un-damaged. Most orders ship within 1-4 business days from our warehouse in Maryland. Some made to size orders could take longer depending on ongoing projects. Please allow at least 5-7 days lead time for made to size orders. Cutoff time for any orders being shipped faster than UPS Ground (i.e. Next Day, 2nd Day, etc.) is 1:00pm EST. For UPS Ground orders, we ask that you allow 1-6 business days in transit to receive your order (unless otherwise requested). Please refer to the UPS Ground transit map below for a more accurate Ground shipping transit time to your location (Domestic) from Maryland. Please note, these times are an estimation and cannot be guaranteed. Most of our film samples are 5" wide x 7" high, with Gradient film samples being 4" wide x full height. You may order up to 5 free samples per project. You may order as many samples as needed, however additional samples are charged at $0.45 per sample. At checkout you will receive an automated credit for the first five samples ordered (-$2.25). We ship all sample requests from our Maryland headquarters. Sample orders are shipped via UPS Surepost for a shipping fee of $3.95. UPS Surepost is a hybrid delivery service that starts with UPS, but can be delivered by your local post office or UPS (pending location). Standard delivery time is 2-7 days. This economy service combines the consistency and reliability of the UPS Ground network with final delivery provided by the U.S. Postal Service. It provides a comprehensive end-to-end economy transportation solution utilizing UPS's powerful ground package network. Expedited shipping options are also available at checkout for an additional shipping fee. If you need it overnight, this is an available option during checkout. When shipping to a location outside of the United States, prior to placing products in your shopping cart, please go to the bottom of our site, click the small flag icon, and select your country. You can then click "continue shopping," and proceed with selecting your products and placing your order. If your area is listed below, please contact us to find our nearest distributor to you. If you are not completely satisfied with our product, please request a return within 30 days of receipt of your order by clicking "Start a Return" below or viewing your order history, under "My Account" when logged in, and selecting the order/products you'd like to return. When requesting a return, you will be able to select the order and products you are interested in returning, as well as select how many boxes you will be returning the product in. Return shipping cost is $16.95 per box. Submitting a return will issue you a confirmation and a return shipping label for each box being returned. A refund for the price of the merchandise will be made if merchandise is returned to us in usable condition. No refunds will be made if merchandise has been cut or if the backing has been peeled from the film or if the merchandise is in less-than-perfect condition. Custom Made-To-Size and Cut-To-Size orders are non-returnable and non-refundable. Shipping charges are non-refundable. When you return an item, please be sure it is in new condition, securely wrapped, and include the original packing slip or copy of invoice. Returns are made to: Decorative Films, LLC., 3909 Cornell Place, Frederick, MD 21703 USA. Any orders returned that were originally shipped with free ground shipping will be deducted a $30.00 return service fee from the total refunded, to cover the original shipping costs and restocking. FREE 2-DAY SHIPPING: Add $159.00 or more to your cart, select the 2-Day Shipping option, and submit your order. Qualifying orders will arrive two business days from the date of shipment. Orders placed before 2PM EST may ship the same day. NOTE: If a Wholesale customer, please log in to see Wholesale promotions. Please note, shipping promotion does not apply to sample orders.